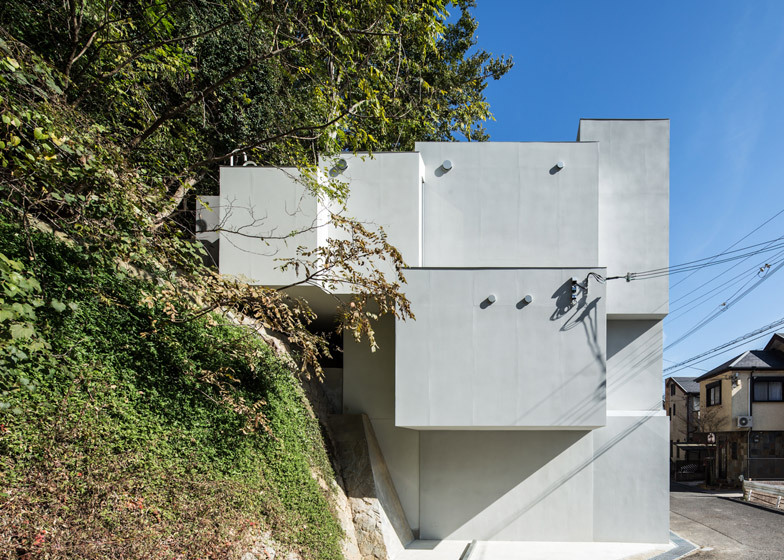 Square concrete frames in different sizes create four layers of rooms for this house at the foot of Japan's Mount Rokkō by Y+M Design Office (+ slideshow). 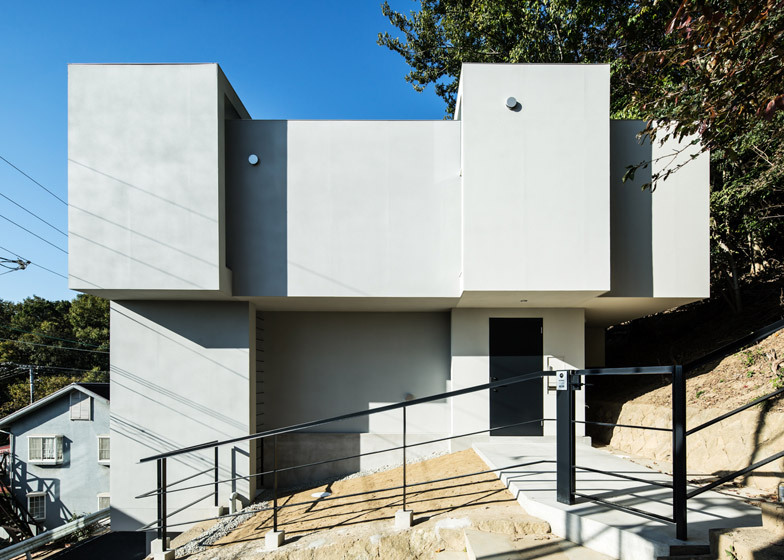 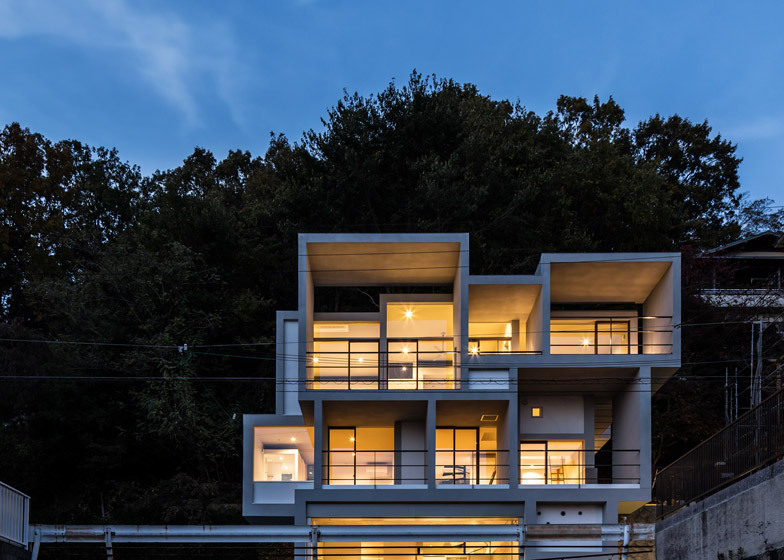 Named Slide House, the family home was conceived by the Kobe-based architecture studio as a "four-layered brise soleil" where each room is a separate volume that partially shades the one behind. 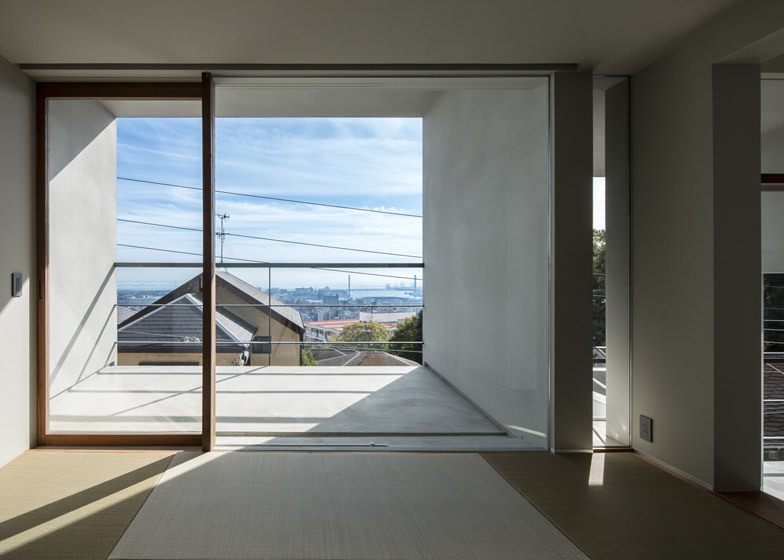 Together, these rooms form four distinct layers that extend from the front to the rear of the site, determined by the level of light and privacy required. 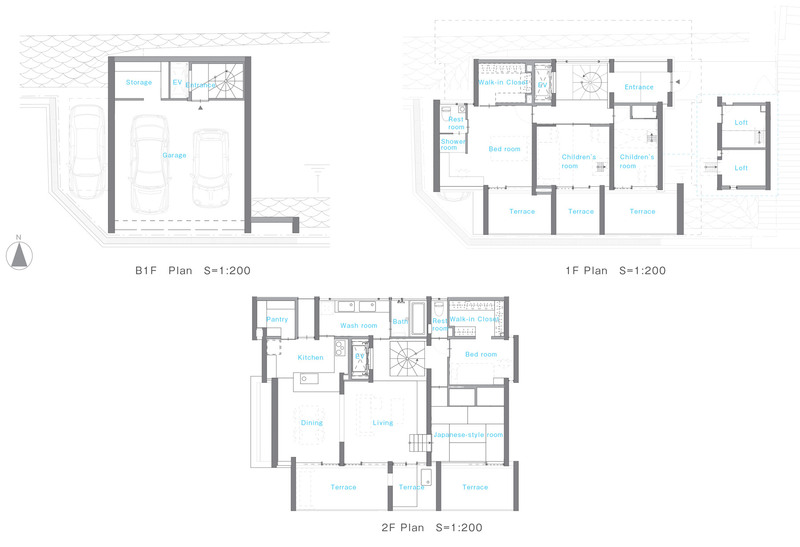 Terraces are at the front, while living rooms and bedrooms are in the middle and bathrooms are set behind. 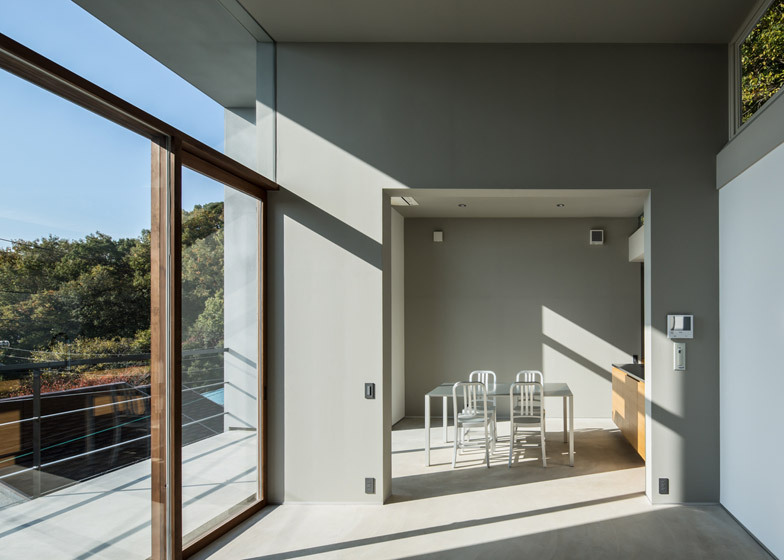 "We had to ensure that the client family has privacy and that they can enjoy nature at the same time," said the architect team, which also recently completed a top-heavy ballet school in Tokushima. 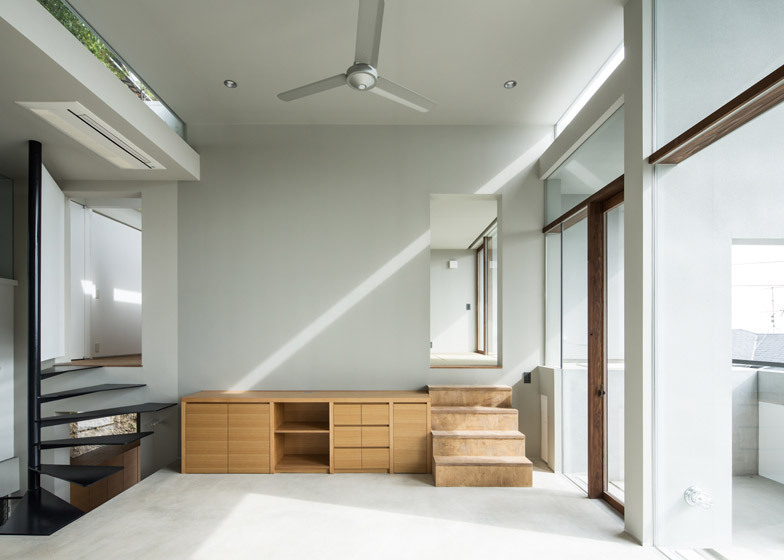 "The four-layered brise soleil can shade from strong sunshine in summer and late afternoon sun, and can take in indirect sunshine, which is reflected by the light shelf to bring brightness into rooms inside." 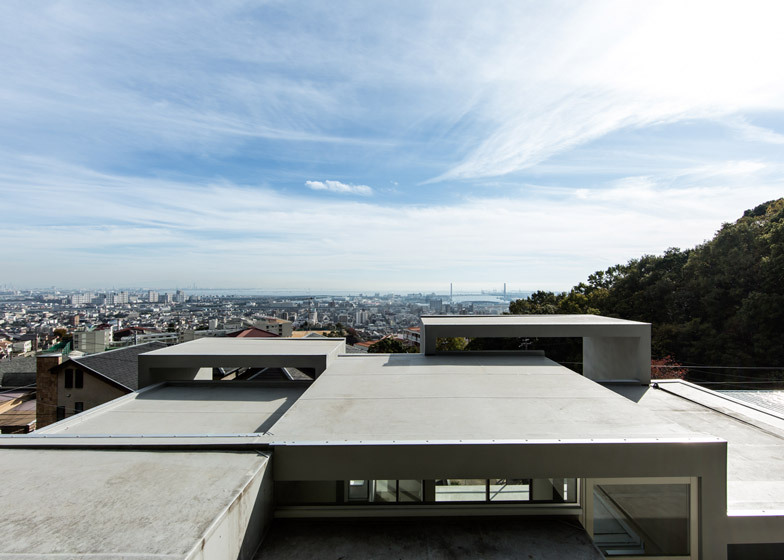 The house is located to the south of the Mount Rokkō mountain range, facing out towards the Seto Inland Sea – not far from another contemporary house, Rokko House by Tato Architects. 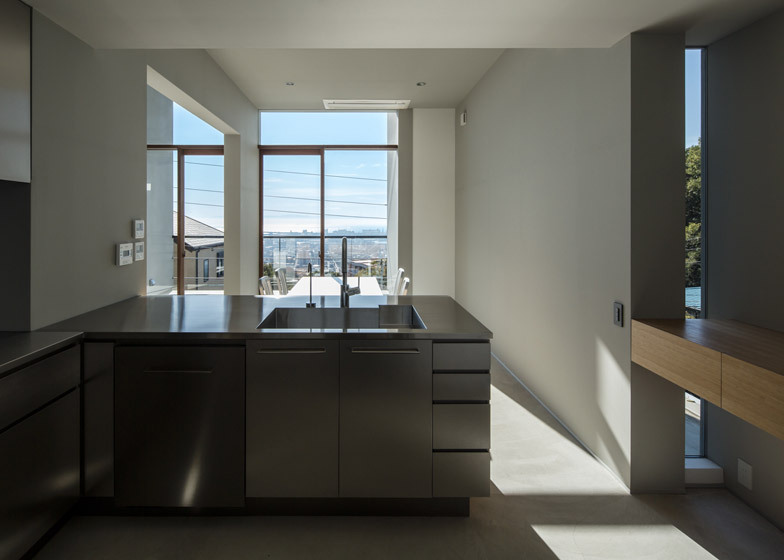 It is three storeys high but because of the steeply sloping site the ground floor functions solely as a parking garage. 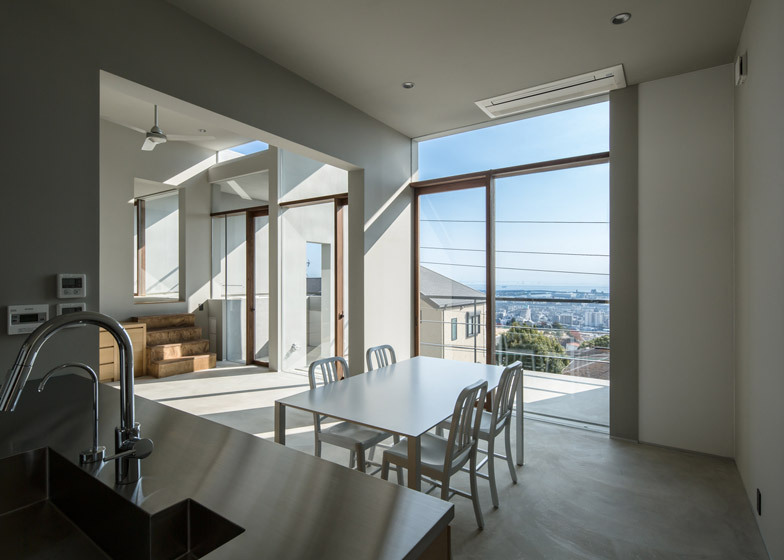 Living spaces are all positioned on the two upper storeys, with some defined by a few steps up or down. 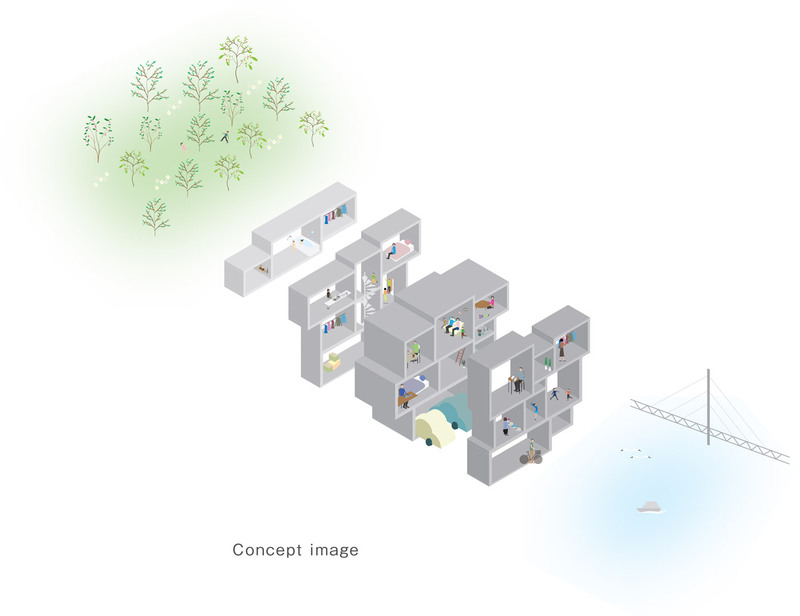 Of the four layers of rooms, the first is made up of six terraces – three on each level. 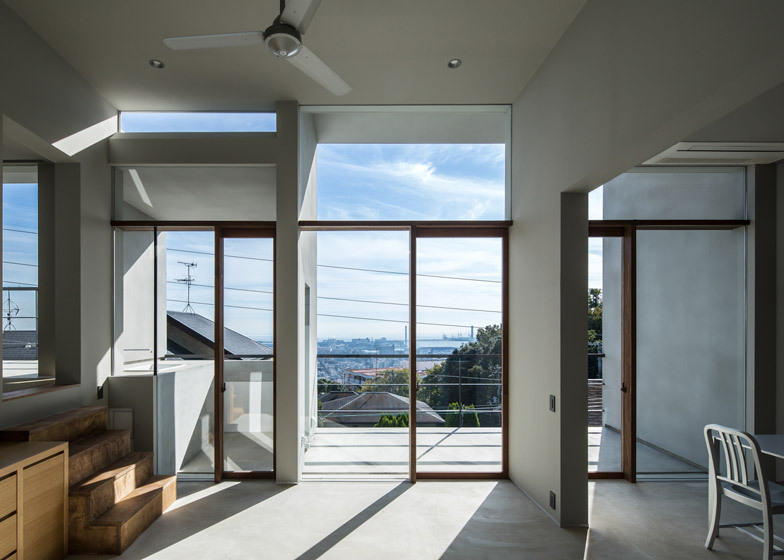 These provide shade for the glazed facades behind, which front a living room, dining room and traditional tatami room on the first floor, and three bedrooms on the second floor. 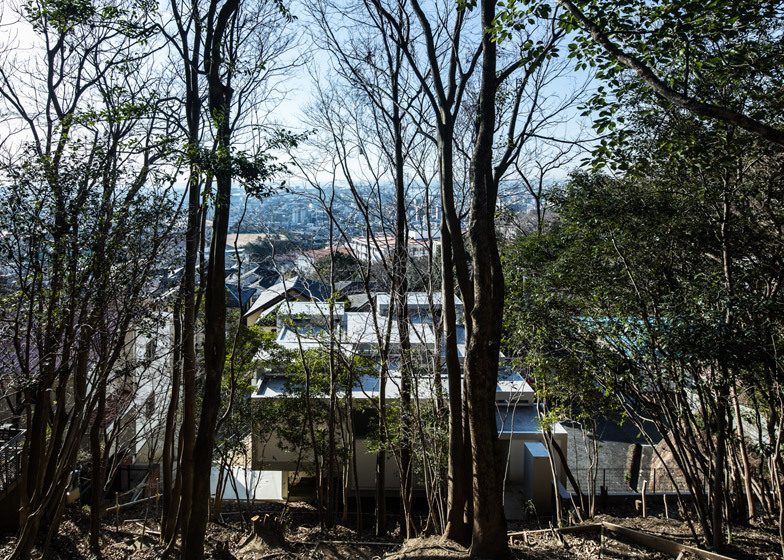 They also allow the resident family to take advantage of the region's typically warm climate by extending their living spaces outdoors. 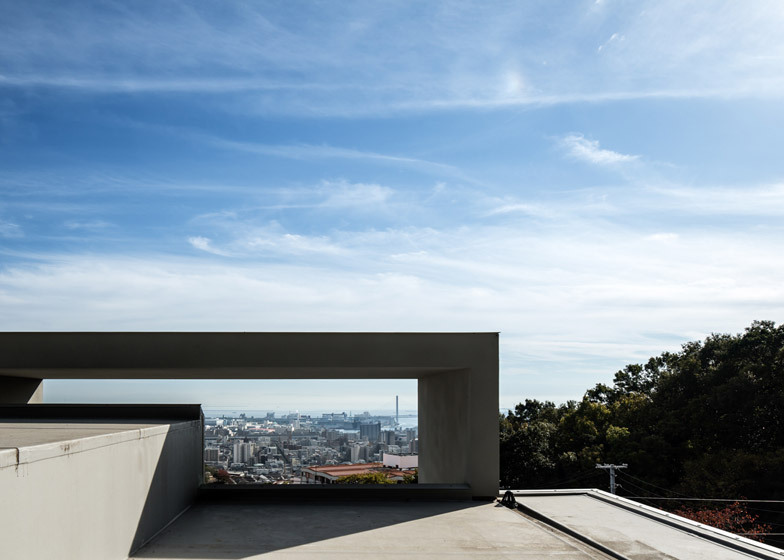 "We designed a space where the sea and the mountain directly connect each other," said Y+M. 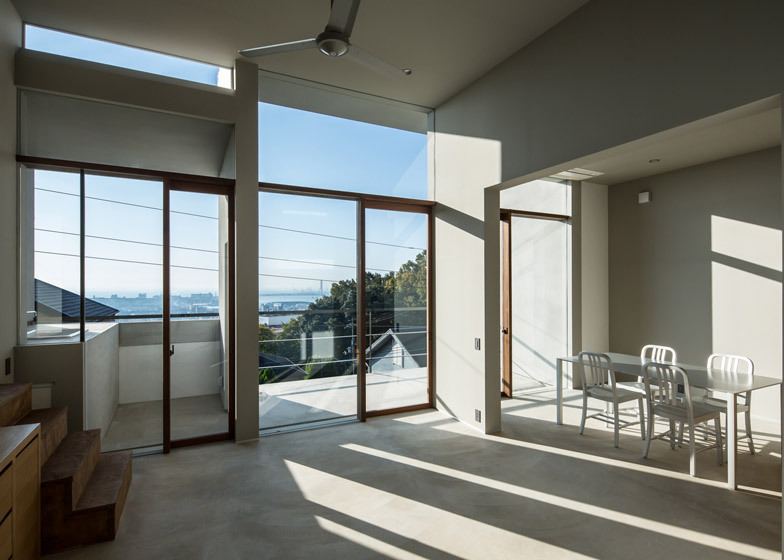 "The brise soleil gives not only framed beautiful scenery into each room but also shades functions from the other lines of sight." 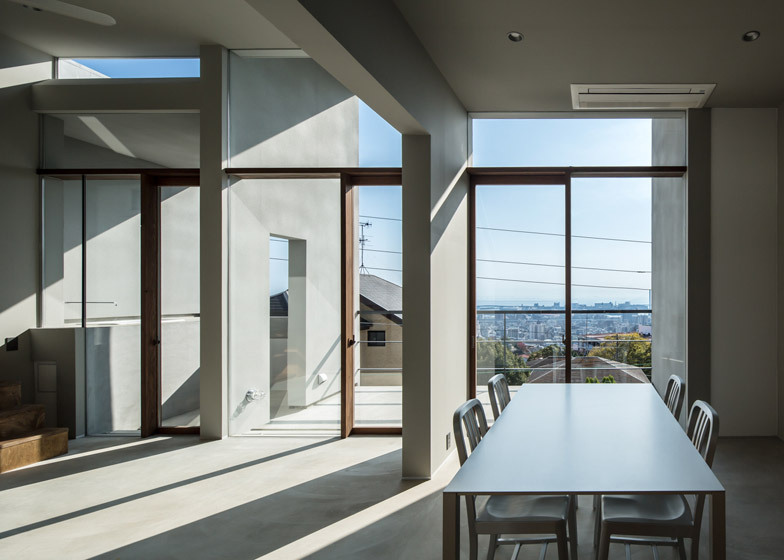 Sliding walls are integrated in various places, offering flexible partitions between spaces and allowing areas of glazing to be shielded. 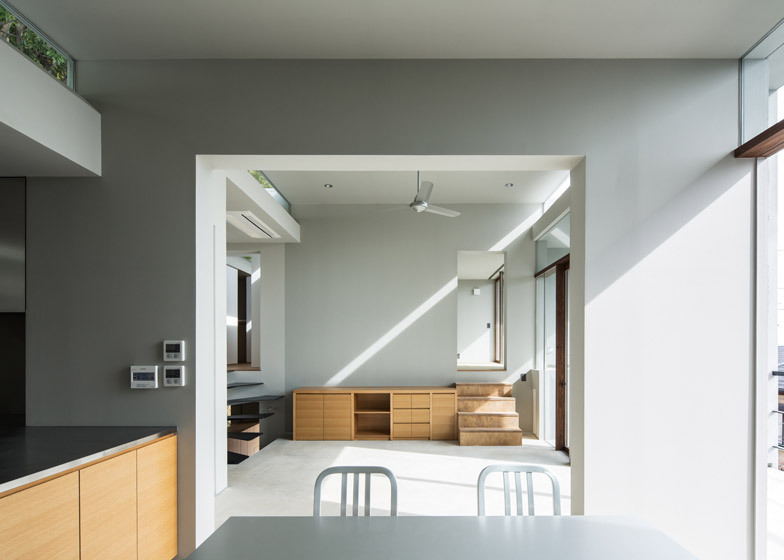 "So the client family can enjoy various changes of atmosphere in accordance with season, time and so on," added the team. 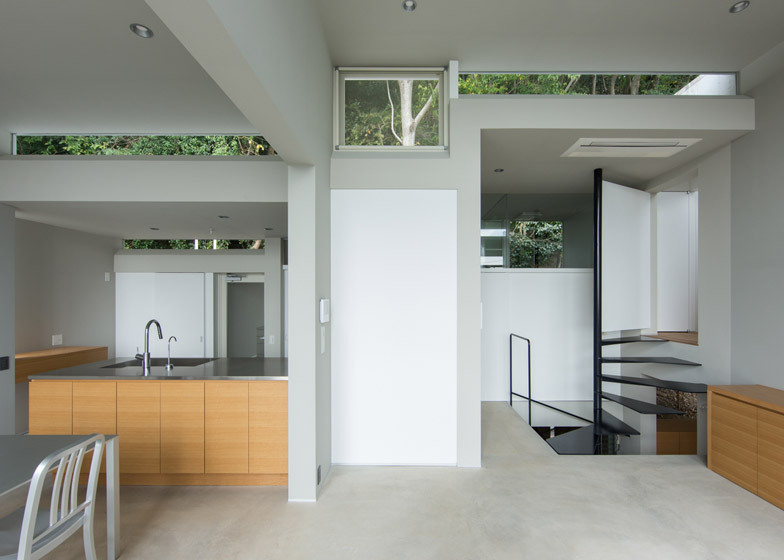 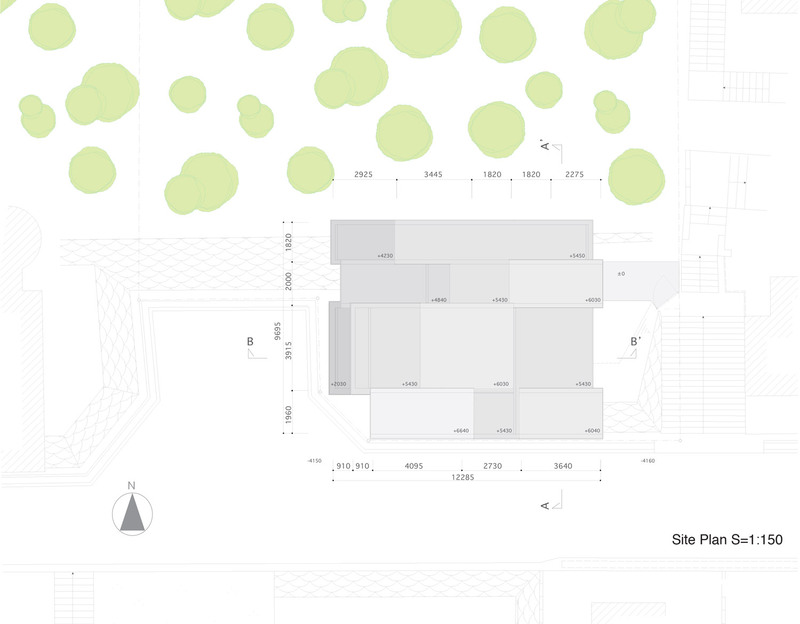 The house contains approximately 200 square metres of floor space. 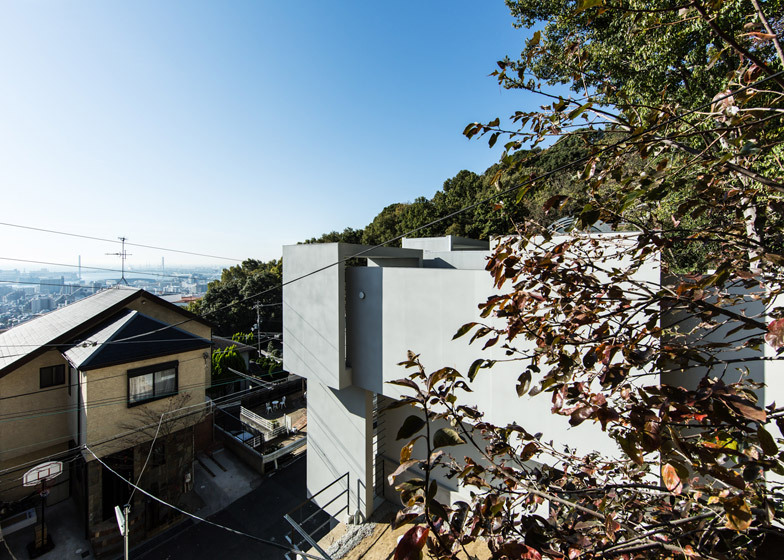 A steel frame was used to provide support to the complex structure, but is completely concealed by the reinforced concrete walls and floors. 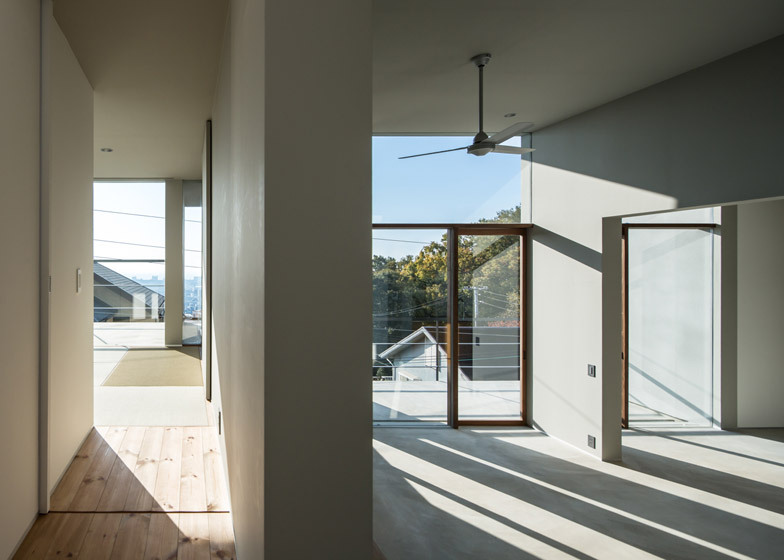 Heating is integrated into the wooden flooring while walls and ceilings are painted a pale shade of grey. 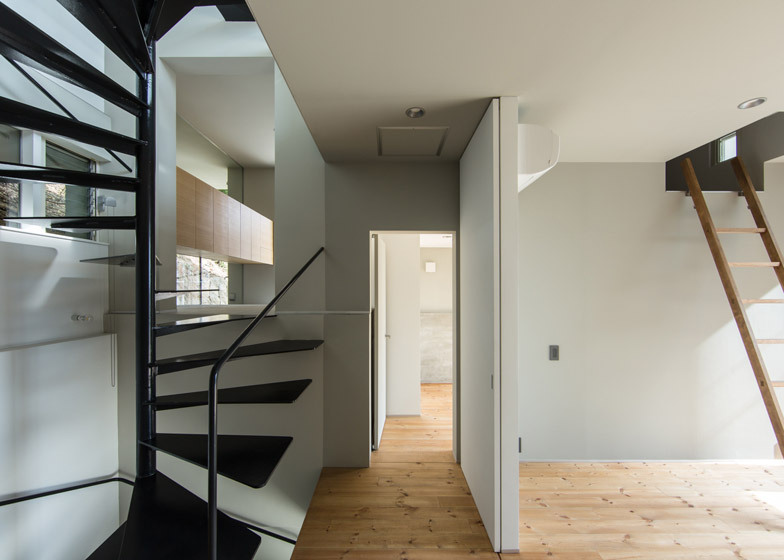 A black spiral staircase connects the three storeys, and wooden ladders lead up to lofts above the two children's rooms. 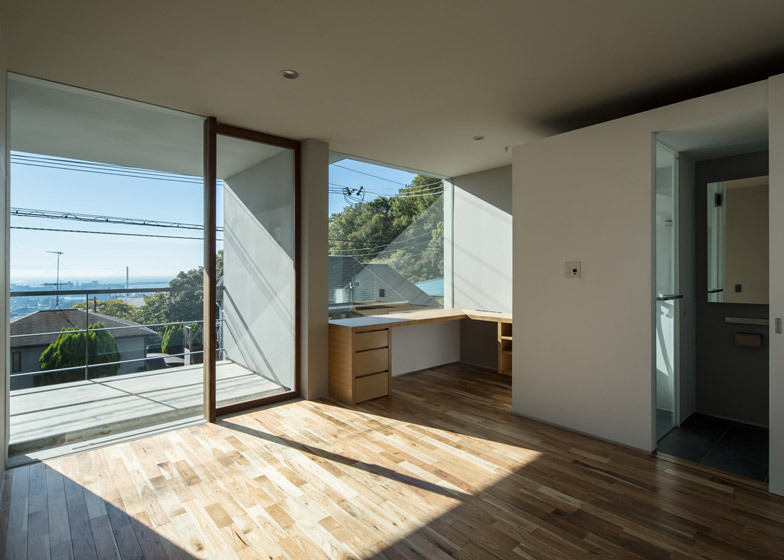 Y+M Design Office is led by architects Hidemasa Yoshimoto and Masahiro Miyake. 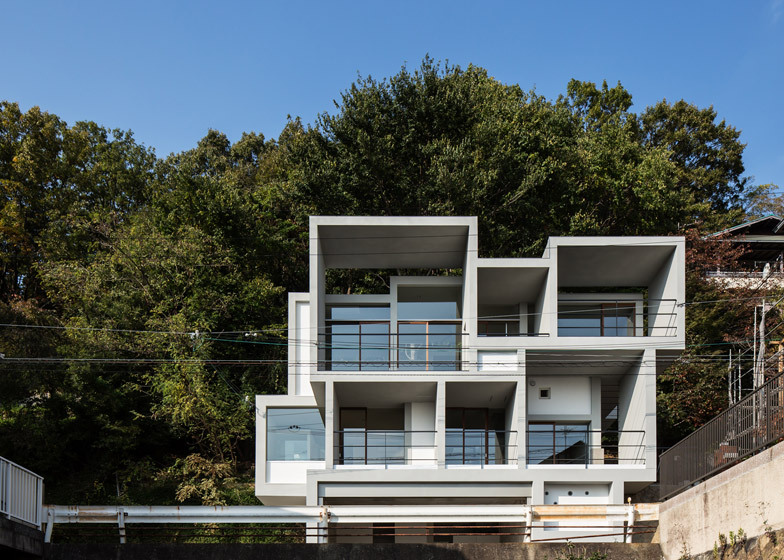 Past projects by the firm include a house with a staircase for its facade and a residence made up of seven house-shaped blocks. 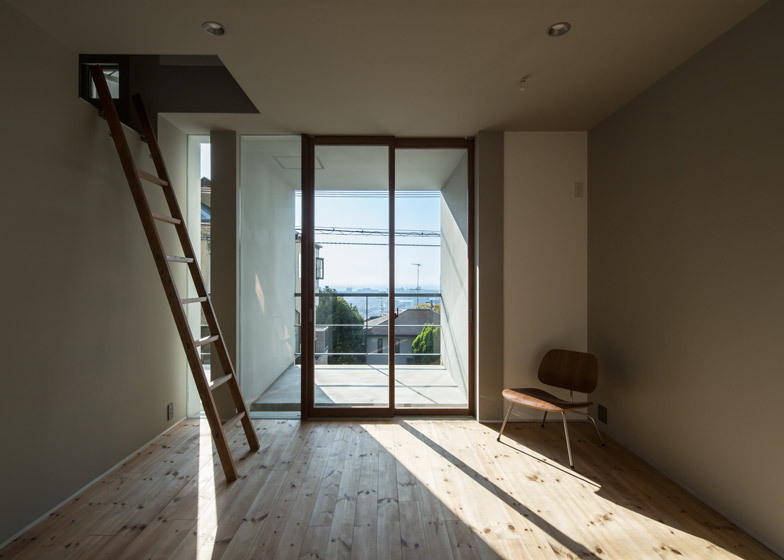 Photography is by Yohei Sasakura/Sasa No Kurasha.